Pros: A wonderful atmosphere and a few laughs. Cons: Lack of development or evolution of the characters. Our Verdict: Light and amusing, but it could be more engaging. With curtain up being about the time of your evening meal, it’s not unusual to attend a show feeling a little peckish, which is somewhat worrying considering that this play is all about food. I should not have feared however, as this play which explores a delightfully ludicrous interpretation of the ‘freegan’ life style (where in this instance food is rotting and found in bins) is so repulsive that I didn’t feel the urge to eat again until morning. Nicely done! 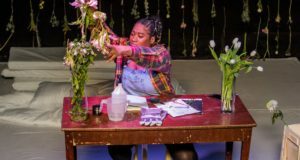 The play follows the day-to-day adventures of a group of (mostly) environmental science students who’ve chosen for various reasons to buy as little as possible and scavenge as much as possible. 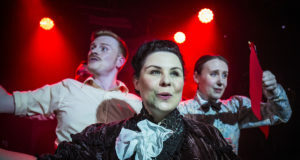 From saving the planet, saving money and saving ourselves from bourgeoisie habits, the characters and limits of their hygiene are satisfyingly diverse with some fantastic performances (my personal favourites being Holly Ashman as Julia and Henry Allan as Gabriel). When entering the theatre, trash – also the title of the play – towers over the stage and the bare, peeling walls, smell and dusty ambiance lend a delightful anticipation to the unfolding events. In a raucous ear-splitting cacophony the cast explode on to the stage and yank the entire set out of the rubbish heap. From then on, the action rips forward with exhilarating energy that never abates. It gives you the kind of exhaustion just from watching that is usually solely awarded to young children. This pace never once sags, which speaks of hours of tireless rehearsals. The jokes remain freshly delivered and are perfectly timed; many of them are refreshingly original which gives you a curiosity in watching as not only do you want to see what events unfurl and the next mad caper to expound, but you also want to see what next amusing turn of phrase will force a giggle and a glance to your neighbour. Unfortunately a number of the jokes were quite obvious and we British do have a tendency to laugh out of politeness which had the effect of dampening the impact of genuine moments of clever humour. The acting is excellent (although slightly less convincing non-British characters) and the show is perfectly cast. The sheer number of people on stage also speaks of truly good direction. However, the characters are extremely one-sided and play up to stereotypes. There is room for this in entertainment, especially comedy, but it is not to my personal taste as the situations thrown at these lovable people are just as single-faceted as the characters. Overall, this is an enjoyable enough experience with friends, but you wouldn’t but it on DVD. With a little more work on developing the characters this could be a very decent show. Trash runs at the White Bear Theatre until 13th April 2013.